A new command line parameter has been added to export the full report to a txt file. + added support of AMD Crimson graphics drivers. + added support of Radeon R9 380X. + added /export_txt_report command line parameter to export the full report to a txt file. It just crashes on Windows 10 64 bit. More details? GPU or drivers version? Free for commercial & non-commercial license then, eh? GPU Caps Viewer is recommended by DriverPacks.net [Nightlies], by the by. GPU caps viewer is excellent for figuring out what Radeon drivers work properly with OpenGL! OpenCL-CPU/GPU testing is a nice feature too! where can i see what other info i can export on the report? 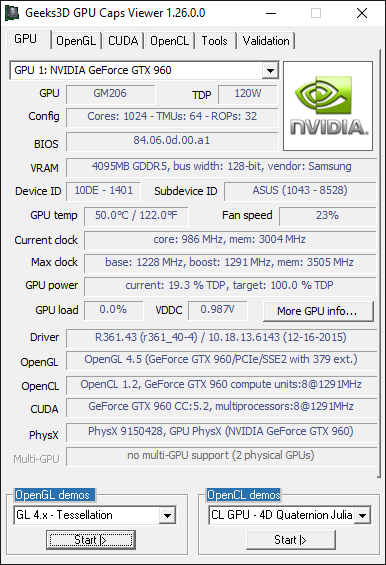 how (for example) i export report that show me GPU temp only?